Semtech Corporation introduced a new AEC-Q100-1 qualified protection array for automotive CAN bus nodes. The company optimized the new low capacitance 24V (Vrwm) transient voltage protection µClamp® array to safeguard automotive CAN bus nodes from threats of electrostatic discharge (ESD) and over-voltage transients. Applications for the protection array include automotive, CAN Bus, FlexRay Bus, and industrial. The CAN networking bus has long served as the basis of vehicle networking and is widely used in today’s vehicles. To adequately provide ESD immunity, CAN nodes require ESD protection with 24V working voltage and a low ESD clamping voltage to safeguard bus nodes from the harsh electrical environment in the car. 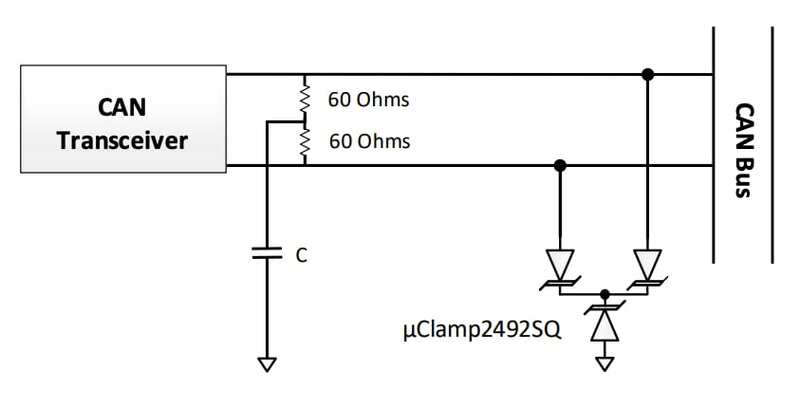 The two-line, 24V µClamp2492SQ provides a low ESD clamping voltage while minimizing loading capacitance, making it suitable for higher speed versions of CAN, such as CAN 2.0 and CAN FD. The µClamp2492SQ comes in an industry standard SOT-23 3L package and provides two lines of robust transient protection. According to Semtech, the device far exceeds the IEC61000-4-2 ESD immunity standards, providing a protection level of ±30kV air and ±30kV contact. μClamp2492SQ integrates two bidirectional TVS diodes rated at 24V. ESD characteristics are highlighted by high ESD withstand voltage (±30kV contact/air discharge per IEC 61000-4-2) and low dynamic resistance. Each device is rated for a maximum EOS current of 5A (tp = 8/20µs). This device is qualified to AEC-Q100, Grade 1 (-40°C to +125°C) for automotive applications. The µClamp2492SQ (order code: µClamp2492SQTCT) is available immediately in production quantities. Semtech offers comprehensive design assistance, including field- and factory-based support.